Home / Technology / Be Careful with Your Next ATM Withdrawal! Be Careful with Your Next ATM Withdrawal! This is really getting serious! Although most banks’ automatic teller machines will have some warning about covering your fingers when you input your pin number when you are making a withdrawal, who has really taken that warning seriously? So, alright! Maybe the guy behind you is snooping to see what numbers you will be punching. But what can he really do even if he sees? And big feller like me, I make sure that I cover the entire machine whenever I make withdrawals. So what can snoopy really do? And especially if I have the ATM safely in my wallet, anyway. Well, as it happens, creativity is not the monopoly of artists alone. Sad to say, but crooks are getting ever more creative than they already are. So, thus, it’s probably best that you cup your palm over the keypad the next time you make your ATM widthdrawal to spare yourself the agony of finding your money gone somewhere to Eastern Europe. 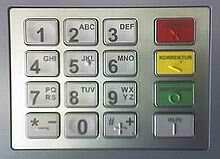 Now read this: you have to cover the keypad with your palm when you make your next ATM withdrawal. I have already started doing so the first time I heard of these employees whose accounts were swept clean by withdrawals made in... Poland! From what I could understand of the news report, the crooks plant electronic devices into selected ATM machines which can not only lift the electronic information embedded in the ATM cards but can also monitor and record the numbers that the user punches into the keypad. The information can then be embedded into another card which is then used to make the unauthorised withdrawals. The process is called ‘cloning;’ and in terms of crookery, the creativity is sublime! Either the information is passed onto syndicates based abroad or the withdrawals are made in the country but cloaked using sophisticated decoys so that the withdrawals appear as though they are made abroad. I understand that most of the ATM clonings have been done in Metro Manila; but one can never be cautious enough when it is one’s blood, sweat and tears that are at stake. I have made a withdrawal from a local BPI ATM which is already equipped with a lid to cover the numeric keypad. A tad inconvenient, perhaps; but the bank’s customer care is comforting to have. Since banks’ reputations are being compromised – and this is really a matter of computer security – then the other banks will be well served by doing something similar. As for the rest of us, it is a small inconvenience to have to place your palm over the keypad; but that small gesture can be the difference between your holding onto your money and somebody else vacationing in the Bahamas because of it. Just this evening, an ABS-CBN employee was featured on TV Patrol as the subject of another ATM cloning attack. She lost more than 130 thousand pesos to a withdrawal made in... Bulgaria! “How can I make a withdrawal in Bulgaria when I am here and my card is here,” she complained. Precisely. And while the Central Bank will probably sympathetically say that the money lost ought to be returned by the bank to the account, my guess is that most banks will see to it that the victim will have to go through unbearable redtape before getting the money back. And tell everyone you know to do exactly the same.